Wood mine was worked between 1857 and 1877 with the main working taking place in the 1860s. Although the mine was closed all its entrances were left unbarred. Accidents by ill equipped visitors were many. The mine was eventually secured in 1964 when the entrance was blasted in by Mr. "Blaster" Bates, a demolition expert of some note, the shafts having been sealed with household rubbish and builders rubble dumped by the local council. The product of this mine was chiefly copper carbonate but lead in the form of galena and cerussite was often found in viable quantities. The ore was removed by blasting with black powder and dug out with picks and shovels, it would then be trammed out of the mine in wooden tubs on wheels to be treated at the mill with the ores from the West Mine. 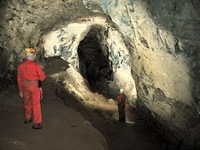 The mine was re-opened by the Derbyshire Caving Club in the autumn of 1970. With permission from the National Trust a small shaft was dug in the roof of the original adit. 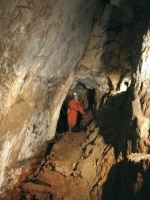 This was the only entrance into the mine until the adit entrance was reconstructed by Derbyshire Caving Club members. In 2001, timber Shaft was secured and dug and now provides a third point of entry or exit. Since re-opening the mine, the DCC has connected it to the Hough Level which runs from the treatment works to Stormy Point. It is now possible to travel from Wood Mine through Brynlow Mine and Engine Vein and emerge at the foot of the Edge. Wood Mine entrance is a short leafy walk from the B5087, through the woods on the opposite side of the road to the Beacon Lodge. As with all the mines of any consequence on Alderley Edge access is now strictly controlled. Entry is via a hinged steel lid in Windmill Wood. An alternative entrance door on the adit can only be opened from inside. The entrance drops into the roof of the adit that leads E to a T-junction. N (left) leads 110m to the N Boundary fault and North End Chambers. Ladderway leads to surface at Timber Shaft (15m). S (right) leads across a bridge to Sand Cavern. From here, three routes lead off. To the SW is a passage heading to Rabbit Caverns and then turning W to meet the lower hauling level. This level leaves the mine in a S direction to join the Hough Level. W and down dip from the junction with the hauling level leads to a flooded stope, Blue Lake. N from this junction leads to the deepest point in the mine where trial passages and workings head off on two levels to the NW. 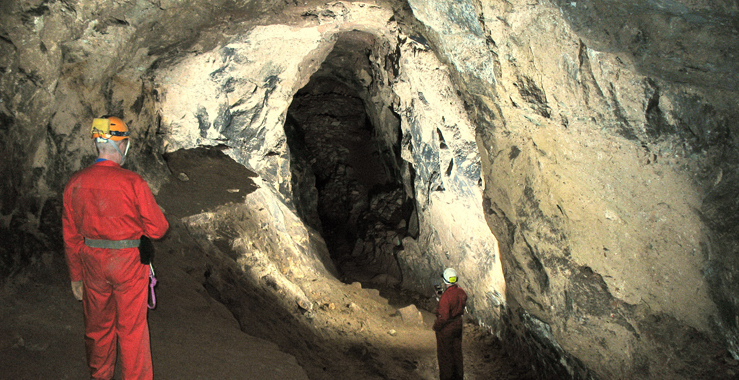 Turning E, the Railway Level can be followed through Key Chamber and the Stream Passage for about 200m walking and crawling through the bottom of the mine to re-emerge in North End Chambers. Leaving Sand Cavern on the S side leads to Junction Shaft (8m, fixed ladders) which drops into a complex series of passages under Sand Cavern. These passages can be followed SW to join the Railway Level at Key Chamber, or NE via the Green Waterfalls to rejoin the main top level on the way to North End Chambers. A third route from Sand Cavern (4m fixed ladder) leads to the Green Waterfalls by a shorter route. 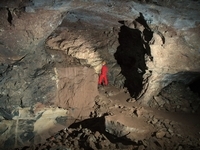 The mine is entered today via a shaft and adit dug open by the Derbyshire Caving Club in 1970 and 1989. 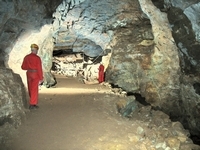 Access to the mine is open to the public by prior arrangement with the Club. 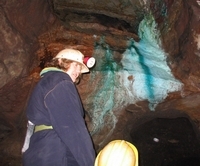 For further information, go the pages on this website concerning visiting the mines. Go to the main photo gallery for more pictures of Wood Mine.